A range of taping machinery for the coil, cable and conductor manufacturing industries. Designed for the efficient taping of narrow wind turbine generator stator coils. The Ridgway NCT Narrow Coil Taping machine offers an advanced and cost effective automated solution for taping narrow profile wind turbine generator stator coils. 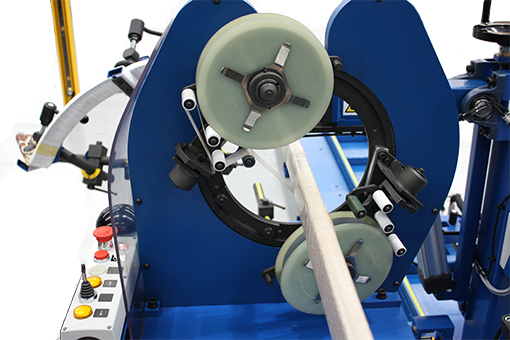 The NCT features a unique multi-axis motion control system with a freestanding programmable HMI, making it a truly versatile machine that simplifies the precision taping of all narrow coil configurations, straight or diamond shaped. The innovative design solves a common problem where traditional taping machines have limited access to both sides of the coil. The coil support system features automatic coil turn-over and height adjustment. This simplifies set-up and eliminates the need to remove or reposition a coil to tape both sides, improving productivity. Ridgway’s skilled and experienced engineers are also available for fast, professional support using remote machine diagnostics as necessary to assist the end user with specific operating conditions. The NCT uses a unique multi-axis head motion. Lateral movement of the NCT taping head is controlled via a servo motor driven ball screw. This in turn is synchronised with the servo motors that drive the rotational aspects of the taping head. The action of this complex head motion results in a precise process that consistently provides high quality taped coils. The Ridgway NCT features constant tension control between 20N and 50N. The machine is fully programmable, for example to set the number of layers required for each coil side, tape pitch and linear speed, the angle of diamond coil legs. Auto reverse at the end of each pass allows for uninterrupted, multiple tape layers without downtime. Operated via a user friendly HMI control module, the Ridgway NCT provides the end user with a simple, reliable coil taping solution. For manufacturers of wind turbine generator stator coils, taping productivity and quality will be increased on all narrow coil requirements. 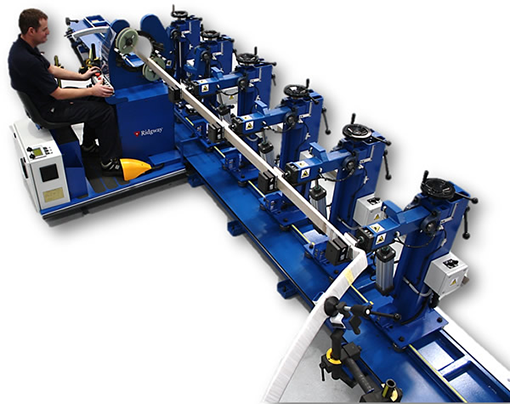 The MTM Mobile/Travelling Head Coil Taping Machine provides a unique solution to maximise the productivity of applying insulation tapes to larger size electrical coils or bars, with a typical slot length capacity of up to 4000mm. Ridgway’s MTM is specifically designed for handling these larger size coils/bars using a combination of retractable pneumatic coil supports, adjustable rear clamp stands and coil eye supports. The taping head is mounted on a mobile carriage which seats the operator and travels along the straight bar or straight leg of coil to be taped, in both directions. As the carriage approaches the pneumatic coil supports, the clamps open automatically and the support arm moves away to the rear of the machine. The MTM machine can be operated continuously in both directions, travel is simply reversed by the operator moving a joystick. The taping head rotates around the coil applying a pair of tapes simultaneously with the tension being settable between 0.5 and 7.0 kg. Tape reel carriers automatically follow the natural angle of the tape being applied to the coil in relation to the coil axis. The MTM head can apply tapes at a rotational speed of up to 250 rpm to maximise productivity. The MTM uses twin variable speed motors to provide and synchronise the taping head drive and carriage traverse functions. These are controlled by a foot pedal mounted on the taping head carriage, with reversing selection by joystick control. Pneumatically assisted coil support and clamping system with 3 retractable arms, fully adjustable rear clamp stands and coil eye clamps/supports. The operator controls for guard reset, bump strip reset, carriage direction selection and taping head drive controls are all mounted on the mobile carriage for ease of use. Factory pre-set acceleration and deceleration ramps ensure gentle start and stop operations. The MTM is equipped with fixed mesh screen guards on 3 sides for operator safety. On the open side of the machine enclosure an electronic light sensor guard automatically detects any intrusion and activates the safety circuit, cutting power to stop the machine.